Greetings from the Critique Club! What a cool shot! I love the curl of the branch and the way it is silhouetted against the sky! Very well done. One thing that bothers me is the leaves on the sides, maybe a slightly tighter crop on the sides so it's not so much part of the shot? Bring more focus back to the curly branch? Otherwise I really can't offer much on this shot, the contrast is great, the colors pop, the shot is overall very well done! Good Luck in future Challenges! This is really intresting! The blue for the background is so good! Hehe. Nice job! Neat branch, and nice contrast. I wish the contrast was a bit more interesting though. Nice contrast in colors and in areas of focus. Done too many times before... but I wonder how it would look tightly cropped on the twigs w/o the leaves? A little boring but I love the background color! Simple and effective use of shape and line, and well placed focus. 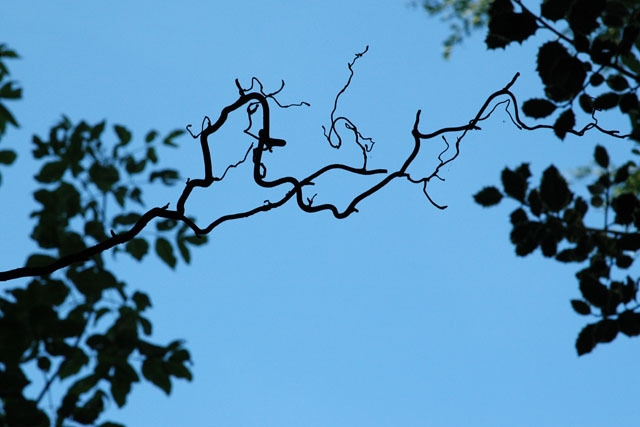 This picture is nice because the curly branch is completelyblack while the background is blue. Two-tones like this one has a nice visual impact, very appealing ! Interesting little twig you got there.. Nice contrast. I'm not very techinical, but I like the main object of your photo. The faded branches off to the left and right are nice too, just alot of blue sky which for me, detracts a bit. Great shot. Grapevine, right? Very interesting composition and nice execution. Proudly hosted by Sargasso Networks. Current Server Time: 04/26/2019 01:58:09 AM EDT.